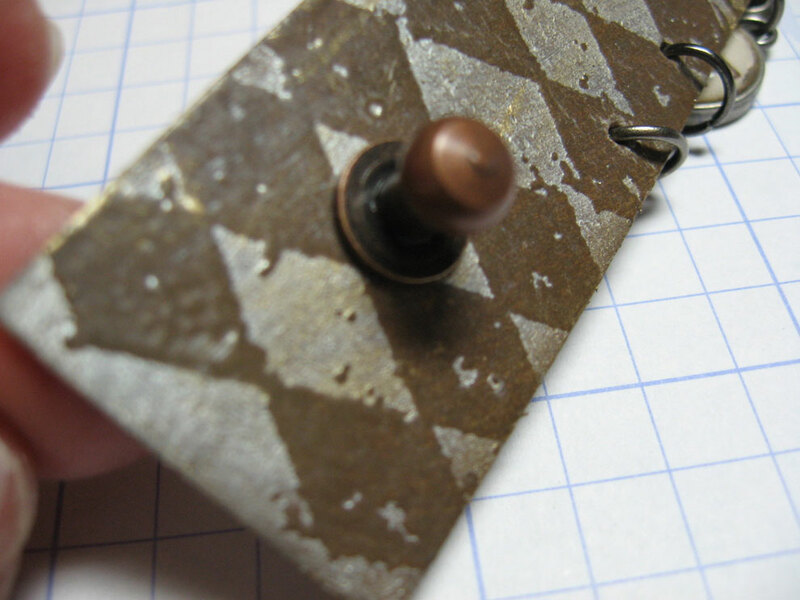 I've always entertained the idea of making jewelry from grungeboard just to see if it would work and hold up well. 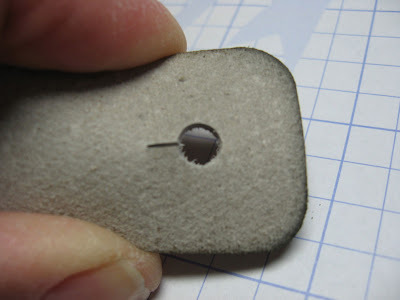 Grungeboard is such an interesting material being thick yet flexible, stampable, and heatable. So I gave it a shot and here is what I came up with. 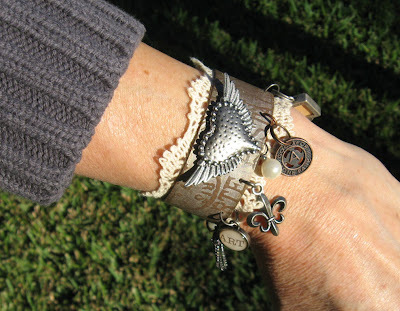 It's more of a wide banded charm bracelet. I told my husband it's my artist warrior band. I ran it through an endurance test yesterday to see how well it would hold up to daily wear and tear. I wore it with a thick sweater and it never snagged anything. I pulled my fleece jacket sleeve off and on several times during the day and it never tore it up or damaged anything. And I thought my skin might get irritated from the materials, but it never did. It was so comfortable, sometimes I didn't feel it while wearing it. I was thrilled! 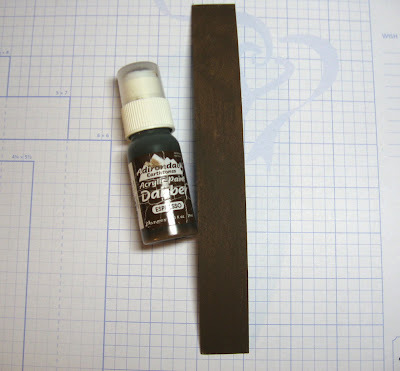 Using an Xacto blade and a straight-edge, I cut a piece of grungeboard 1-inch wide and used the full length which is about 8 inches and painted it with Espresso paint dabber. 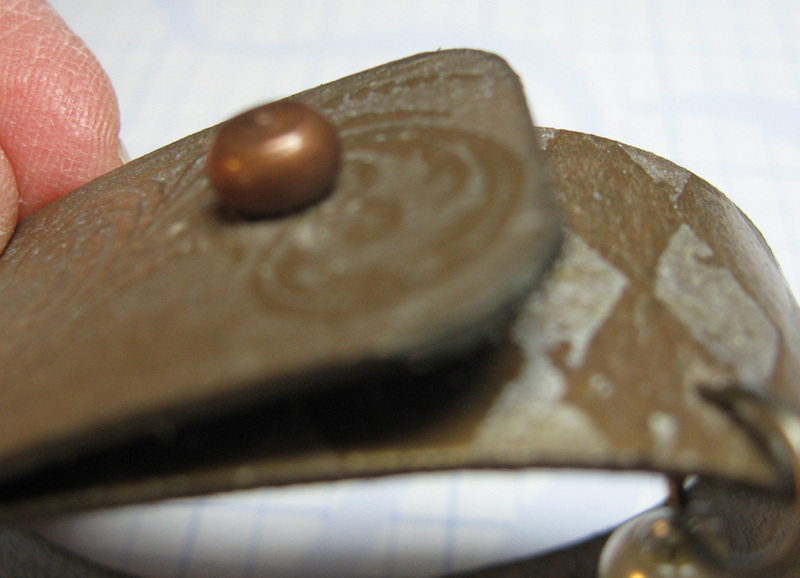 You'll see that I later used the Chomp tool (Crop-A-Dile Corner Chomper) to round off two of the corners on one end. I should have done that step here. 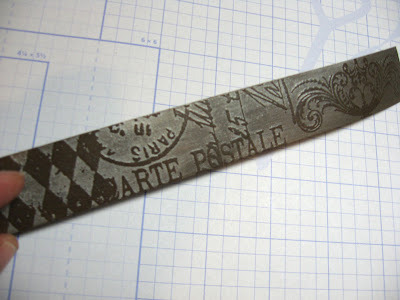 Then I stamped several images from Tim's French Market stamp set with Versamark, then embossed with clear embossing powder. 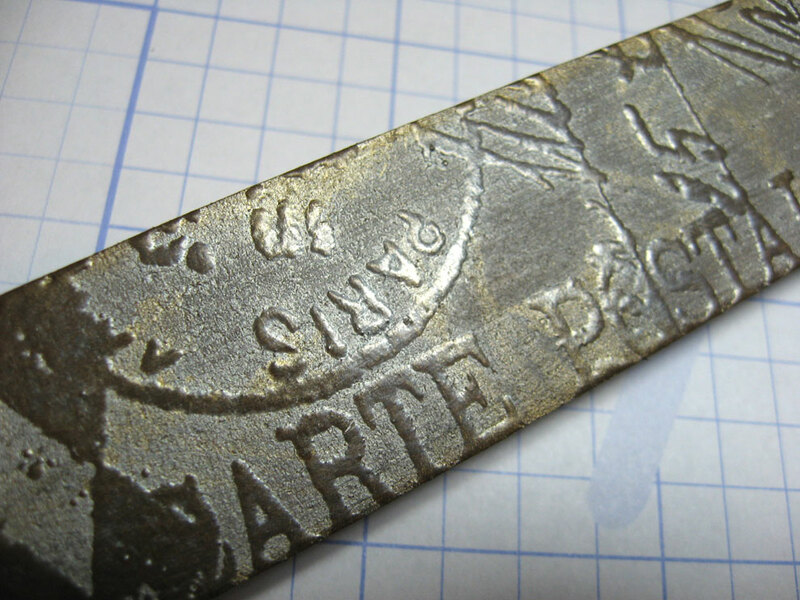 I swiped some Pearl paint dabber over the embossing and rubbed away the paint on the embossed areas with a damp paper towel. Then I used Gold Mixative on my finger and rubbed it here and there, mostly on the edges. I'm not sure why I used Mixative instead of paint. It just seemed like a good idea at the time. I used the large end of the Crop-A-Dile hole puncher and made a hole for a hitch fastener to fit through. (Notice the rounded corners on the band now?) I also made a slit so that there was a little more "give". I tested this first without the slit and it made the grungeboard tear and fray a little bit when I pushed the hitch through it several times. I pierced a smaller hole in the other end of the band from the under side and then inserted the hitch fastener screw. Then from the top side I screwed the hitch to the screw nice and tight. This becomes the closure for the bracelet. 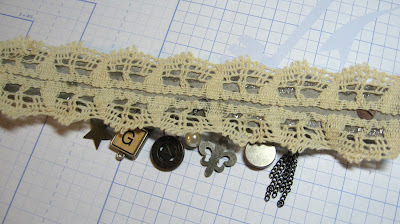 I measured a center point on the bracelet, then pierced holes along the bottom edge for the charms. 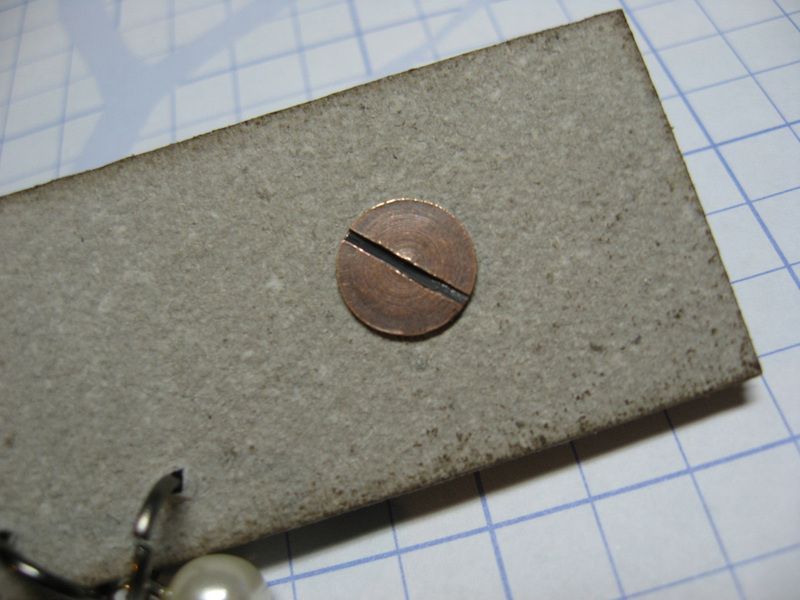 I measured out from the center point only, but didn't space the pierced holes evenly because each charm dictated how much space between each pierced hole. So I laid each charm in place, then pierced the holes. Make sense? I typed the word ART on my computer and punched it out with a 1/2 inch circle punch which fits perfectly inside one of Tim's type charms. At first I thought the bracelet was fine as is, but then I felt it would be more comfortable and a little more feminine if I added some antique looking lace. I liked the idea of the hard mixed with the soft. I glued the lace to the back with E6000 glue. I love this glue because it's clear, stays flexible, and will hold just about anything. If I were a neat freak, I would have maybe added some ribbon or seam binding or thin wool felt to cover up the glue, but I didn't care so I left it this way. I added some wings and a heart from Tim's Adornments with E6000. I made sure not to put the glue all the way to the edges of the wings so that the bracelet would bend and curve naturally when around my wrist. If I had glued them down, it would have created a flat spot and I didn't want that. 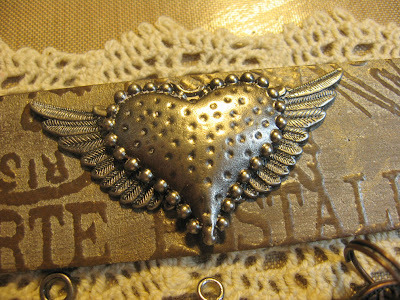 You might also notice that I cut the ring off the top of the metal heart. I used Tim's Tonic scissors very carefully to snip it off. Here's another look at my artist warrior band. I can't wait to wear it again today! This is very, very awesome. It is so cool I can't stop looking at it. Oh, let me know when you decide to do a Tim jewelry workshop....tehe! I want to try this SO bad! Your's is to die for gorgeous!!!! What a wonderful bracelet! I so want to try this, thanks so much for the idea and tutorial.....fantauboulous! Love it! The bracelet turned out so nice! Amazing stuff that grungeboard is. That's a great idea! Who would've thunk! This is such a great idea! I'm putting it on my things-I-wanna-make-list for sure! Love, love, love this! I'm pulling out my grungeboard the first chance I get! omgosh I love love love this...thanks for the inspiration!!! sooo beautiful!!! Awesome, Annette!! You are da bomb! LOL! 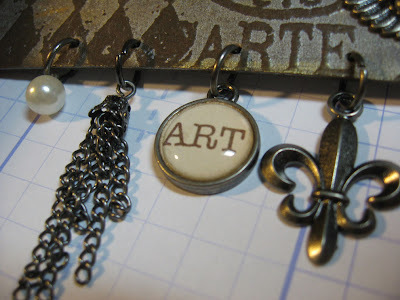 Going to make my own warrior artist band . . . .
Gorgeous! I sure hope you sent Tim an email and a link to your blog--holy smokes! Great work! 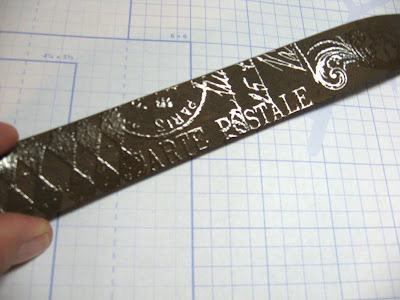 I made a grungepaper bracelet last year and you're right, they are SO comfortable! I did learn the hard way (I really should have known better) not to use distress ink since it's water soluble, it rubs off on the skin very easily! 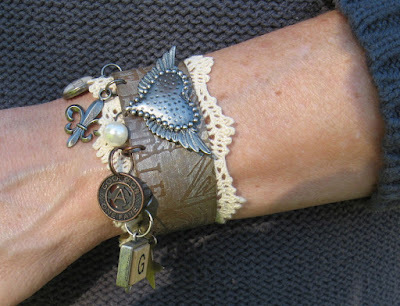 This is a wonderful bracelet! I now need to get some charms and use my grunge paper to try it out. WoW, this is amazing!! TFS!